Magdeburg/Cochstedt airport by Captain7 and 29Palms. Small airport right in the middle of Germany and a nice place to visit in Flight Simulator X. What I like in EDBC? I like this airport mainly because it is so versatile. Judging by it’s size one could say that it’s large enough for a general aviation traffic, small turboprops and occasional 737 flying a holiday charter when in fact a 747 can land here and planes like MD-11 and NATO AWACS 707 used this airport repeatedly. At first it was a Soviet air force base in Eastern Germany. Today – there are no signs of this, maybe apart from several blocks of flats located close to the airport (you can see them in this scenery). After Soviet/Russian forces withdrawal Magdeburg/Cochstedt was converted into a civilian airport. As such it is struggling to attract airlines and passenger charters. For a few years Ryanair planes landed here regularly but this ended in 2013. Currently airlines use this airport rarely for charter flights and cargo becomes the main source of it’s income. There is a large scale expansion plan currently implemented with two storage halls being already built (you can see them in the scenery). Visualizations of future cargo section are impressive – watch them in the airport’s promo movie. The airport is also used by general aviation planes and business-jets. I am reviewing EDBC Magdeburg/Cochstedt 2015 available in developer’s shop where it costs 15,95 Euro (roughly $18 at current rates). Works exactly as it should – download the installer, then run it – everything will be installed automatically (scenery will be added to your Scenery Library). If I ever need a scenery manual to point to as an example of how such manual should be created – it will be this one. In first chapters the real airport is described. Then there is an installation manual (nor really necessary as it is a straight forward process) and system requirements (again – not necessary – the performance of this scenery is superb). Then there is an information on how to properly set up FSX or P3D. The scenery uses high res textures as an option so please pay attention. Scenery configurator and updater are also described. What I like most are the charts. The manual has charts for airport stand numbers (I often miss such chart in add-on manuals) and there are all charts for IFR approaches and departures for this airport. It is not difficult to find such charts on the internet but it’s nice that I do not have to look for them. The manual is available in German and in English. EDBC Magdeburg/Cochstedt 2015 is an airport scenery – it covers the airport and the area of about a kilometer or two around it. For the best quality you should set TEXTURE_MAX_LOAD parameter of your fsx.cfg to 2048 or 4096. What to fly and where to? As I mentioned in airport description – cargo traffic and general aviation make the most of Magdeburg arrivals and departures. RAF Avia has their An-26 stationed here and turboprops of this company (they use Saab 340 too) use this airport frequently. If you look for something larger – airport brochures state proudly that even 747 can be handled here. I found several pictures of MD-11 in Magdeburg. There are also some photos of NATO AWACS plane E-3 (based on a Boeing 707) flying to Magdeburg for training. The size of the runway and airport’s taxiway load-capacity is usually a limiting factor – not here. Feel free to try landing almost any airliner in Magdeburg. Just watch out for the runway length – 2500m may be insufficient when aircraft is fully loaded with fuel. If you prefer small jets and GA planes – any of these will look great here. Where to? The nice thing about flying cargo planes it that there are almost no restrictions even if you follow the strictest “as real as it gets” rules. Just find the airport you like and fly your cargo there. They most certainly need something that is manufactured in Germany. In case of passenger charters – I suggest holiday destinations in Mediterranean. Madeira should be nice too. The first time I saw Magdeburg airport was when I landed here. I did not even test the scenery – just installed it, checked if it had been added to scenery library and planned a short flight from Heringsdorf (another great airport by Captain7 – and a free one!). On approach Magdeburg/Cochstedt was clearly visible against the default scenery (I do not have any photoscenery for this part of Germany). It is interesting how the scenery fits into the background. It does not use blending so the boundary is pronounced and there is no doubt on where it ends and where the surrounding scenery takes over the ground. But for once – I am not displeased with the lack of blending – it is not the usual case of square scenery background texture that joins the area randomly. Here – the boundary line follows terrain features (mainly – the bounds of fields) and this complicated shape looks quite nice – even when it is joined by awful default scenery. After landing I follow the yellow line of taxiway to my stand. Few things caught my attention on the way. The first was the quality of runway textures. I am sure that I have seen runways that had higher resolution but this here is sufficient. What I like in it is the attention to details – for example there is a draining system on the side of the runway. Seen from above – these are simple plates of concrete with long holes where water enters. Maybe how the water drains it is not important in FSX but I like being able to see such details. The quality of runway and taxiway markings is also very high. I am referring to both the lines and the signs and lamps next to the runway and taxiways. There are several static planes on apron. The most interesting is a small jet that is being worked on. A mechanic is laboriously cleaning the engine nacelle. It has to be tiresome to clean the jet with a small sponge and a bucket of water placed on a cart next to his ladder. The poor guy has to walk up and down this ladder to soak the sponge. Things like this are what I love in modern FSX sceneries. If you look around this one – you will find more such scenes – there is a man reading his newspaper and a second next to him – walking while he is talking on the telephone. Airport cars and baggage cart tractors follow their assigned paths and the markings on apron. I put the lighting of this airport in “what I like” section and in “what can be improved”. I generally like the lighting. It is important for me that the brighter textures fit the light sources and Captain7 achieved just that – it is brighter underneath the lamp and darker elsewhere. I can not say this with any certainty as I have never been to Magdeburg but I am pretty sure that the airport is brighter in nighttime. The lamps here look like they were in power-saving mode. Maybe it looks like this in eco-friendly Germany, but in Poland the lights would be more intense. As it is a small airport – there are few buildings here. But it is not about the number – it’s about quality and I like what I see. The airport building and the terminal next to it are very similar to the real ones and the cargo storage space in two blue halls looks exactly like what was built recently. Even Google Maps do not have this buildings on their images yet. What I like most is this terminal building with an interesting air conditioning (probably) units in front of the building. You will see the air conditioners and large pipes connecting them to the building. I wonder what was a reason for such an unusual solution. The only idea I came up with was that this is a prefabricated building with a light frame construction that would not support the weight of A/C units on it’s roof (where usually such devices are placed). There are plenty of little objects (and not so little too) placed everywhere in this airport. Walking around you will find warning cones, carts with red and white tape (to fence off aircraft engines during boarding), air stairs, hydrants, wheel chocks, baggage carts, etc. In regard of this tiny objects that fill the scenery – this is one of the best airports I know. It is not only the number, but the placement that makes it so good – all this objects perfectly fit their locations. This scenery uses the same or similar technique of placing 3d grass as Captain7’s Heringsdorf. A delicate grass models cover ground in correct places (where grass grows). What I like in Captain7’s approach is how he managed to give the impression of grass volume without sacrificing the view from above. With more pronounced grass models/textures the models may look odd when viewed from a plane in a traffic pattern. Here they are subtle enough to almost disappear when looked from the less favorable angle. In short – dense and correctly placed! As the scenery uses a aerial imagery for background texture it is possible to compare the tree positions with the real ones. It is nearly spot on in every place I looked. I often complain about the tree density. Not this time – the trees grow next to each other like the real ones. In this review I have not mentioned all such details – there are plenty. It is what makes Magdeburg/Cochstedt a pleasure to fly to. Perfect. I see no adverse effect of this scenery on my FSX. In case you run FSX on a low-end PC – there is always a configurator where you can decrease the load by turning off additional features of this scenery. This is an example of a very good scenery design. I am not surprised – I am a fan of 29Palms (they are behind Twentynine Palms and Sumburgh that I already reviewed, and Skiathos that will be reviewed soon) and Captain7 made a great freeware Heringsdorf (expect my review soon). To sum up my thoughts… The best thing about this scenery is that it is all around good. 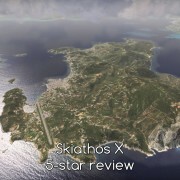 I found only a minor fault in the texture resolution – mainly at the back of the airport (back – as viewed from plane’s cockpit). 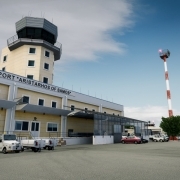 If you are looking for a nice airport to fly to – it is a good choice. And it’s price makes it even better. 16 Euro or 18 USD is a little less that I would expect for such scenery. It makes the quality to price ratio superb. If you have 16 Euros to spare – go to 29Palms store.